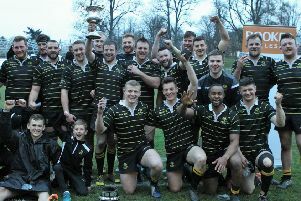 Reigning Kings of the Sevens champions Watsonians picked up where they left off at the end of last season with an opening tournament victory at the Peebles Sevens on Saturday. The move to have the Peebles event on a Saturday, at the beginning of the pre-season fixture schedule rather than a Sunday in mid-August, continues to prove a great decision by the event organisers. In surprisingly good conditions, a large and enthusiastic crowd was treated to a richly entertaining day of sevens action and worthy winners in the shape of Watsonians, who claimed the opening round title with a 31-14 victory over Gala in the final. “Very satisfying, isn’t it?” said player of the tournament, Watsonians’ Ali Harris, following the victory. Watsonians claimed the top honours of the Kings tournament last season, showcasing a combination of speed, power and natural sevens skills. The Edinburgh side continued that on Saturday, easing past Biggar (26-0) and Kelso (30-12) in pool three to move on to the semi-finals. Biggar and Kelso played out a close 12-5 in the remaining pool fixture. For Gala, the Maroons dominated Selkirk (47-5) and Berwick (45-0) in pool one to book their place in the last four. Selkirk beat Berwick (35-12) to complete the pool. In pool two, Edinburgh Accies moved into the semi-finals with wins over Earlston (43-7) and Peebles (38-7). The hosts defeated Earlston (29-12) in the third pool match. Pool four ended up being the most fiercely contested, with Melrose squeezing into the last four. The Greenyards outfit defeated Jed Forest (19-12) then drew with Hawick (14-14). Jed completed the pool against Hawick (29-10). In the semi-finals, Gala earned their place in the final with a 26-5 victory over Edinburgh Accies while Watsonians left it late to take down Melrose 26-21. In the final, Gala could not have asked for a better start, with Rex Jeffery and Craig Russell touching down in the opening minutes. Graham Speirs converted both tries to hand the Maroons a 14-0 advantage. Watsonians started to work their way into the contest and eventually found a breakthrough when ex-gala star Keith Young raced home untouched. Euan McKiroy added the Edinburgh side’s second, with Ali Harris converting both, to draw the scores 14-14 at half time. First round – Selkirk 5, Gala 47; Selkirk 35, Berwick 12; Gala 45, Berwick 0; Earlston 12, Peebles 29; Earlston 7, Edinburgh Accies 43; Peebles 7, Edinburgh Accies 38; Biggar 5, Kelso 12; Biggar 0, Watsonians 26; Kelso 12, Watsonians 38; Melrose 19, Jedforest 12; Melrose 14, Hawick 14; Jedforest 29, Hawick 10. Semi-finals – Gala 26, Edinburgh Accies 5; Melrose 21, Watsonians 26. Final – Gala 14, Watsonians 31.